Do you love your business? I do now, but it hasn’t always been like that. All the businesses I’ve run have come from passions I’ve had, and I’ve loved them all. However, times change, life happens, and I know I’ve fallen out of love with some of these over time. My difficulty, in business, came when it took me too long to recognise I know longer loved what I was doing, and I held on to the business for longer than was good for me. The business suffered. The hardest time for me, was when I was holding on to a wonderful business I set up, bras4mums, when I’d stopping loving it. I loved the results it gave it’s customers, but my focus had been taken away onto other aspects of my life, and I knew I wasn’t giving it the attention it deserved. As soon as I made the decision to let the business go, by selling it to someone who loves it, the weight lifted off my shoulders, my mind became clear, and I was able to focus on my other work and businesses. I started flying again, and loving everything I did. 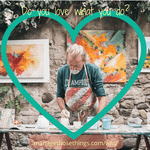 How do you know if you love what you do? I often get asked this. For some people, it’s obvious. They know as soon as they wake up in the morning what they’re setting out to achieve, and the small step they’re taking that day to work towards it. For others, it creeps up on you, like it did for me. It may be that you love working with customers, or creating the product, but you don’t like all the pfaff that goes with running the business. Or, you love working from home and the flexibility it gives you, but you don’t like worrying about when you’re going to get paid next. why did you first start your business? what do you like least about running a business? if you didn’t have to work for money, what would you do? These questions generally spark ideas, or questions that they have been hiding from themselves about what they love, and what’s not so great at the moment. What’s the difference between love your business & love your family? Well for me, I knew that when bras4mums came to life, it was a new baby in our family. It wasn’t just that this business was born 6 months after my youngest son was born. It grew with us as a family. Whilst I didn’t have to feed and clothe it, if I didn’t love and nuture it, it wouldn’t sustain it’s own life. I know some business owners keep their business life quite separate from their family life. There’s nothing wrong with that. But as business owners we are who we are, and bring ourselves to our business. Does that separation mean that this business isn’t part of a nuturing family structure? (maybe that’s a question for another day). I believe you can love your business with passion, in the same way you love your family. Your business can give you back enough love and support, from customers, and the joy you bring others through products and services, to warrant it’s “seat at the table”. Now your family may disagree with the amount of time you’re spending on your business, and say, “you love that business more than you love us”. Is that how it feels sometimes? Just think of a poorly child. How much time will you spend with the child to nurse them back to health? Will you do the same with your business? Enough for what? The time away from the family? Time v Income equation? Effort v Reward? Go back to the questions I ask my clients. Why are you in business? What’s important to you? You need to be really clear about what you’re doing with your time, and what you want to achieve. Not just in your business, with your time. We only have so much of it, and we know we want to make the most of what we have. I’ve been learning a lot about myself these past few years. I felt there was something missing, or I’d missed something vital. It was almost like I knew I hadn’t found my “thing”. When I read Simon Sinek’s “Start with Why” book last year, everything started making sense again. I undertook my own Find Your Why session and was amazed at what I learnt about myself, and it was almost like a game of Ker-plunk, where everything starts falling into place. Even though I loved what I was doing, I didn’t know why I was doing it. Once I learnt why all these different things were important to me, I started doing more of each of them, and loving them all even more. If you answer YES straight away, that’s fantastic. I’d love to interview you for our #inconversationwith series, so please get in touch. If you’re wavering, and saying, something like, “well, I think so”, or, “I love this part of it”, or, “I used to love it”, then maybe it’s time to review what you love doing. There’s nothing wrong with reviewing your business (we should do it regularly anyway), and your role within it. Let’s book a Find Your Why session together, and really get to why you love your business, (or parts of it), so you can move forward with confidence to grow yourself and your business. Recently I was lucky enough to attend a ‘Find Your Why’ session with TJ. This session is really worth your time for both your business and personal life. In fact what TJ will get to, is what your personal strengths and traits are and how these can be incorporated into a successful business. TJ is an excellent listener, and this is essential to this session. You need to be prepared to ‘go deep,’ tell the stories you really want to tell and watch TJ bring out the main themes and characteristics to help you bring your core values into your work life. N.B. The Find Your Why session is a bonus in our Confident Business Owner programme, for extra value. http://managethosethings.com/wp-content/uploads/2018/06/Manage-Those-Things-2-300x100.png 0 0 Manage http://managethosethings.com/wp-content/uploads/2018/06/Manage-Those-Things-2-300x100.png Manage2018-02-13 20:15:272018-06-03 14:36:40Do you love your business? What is the Business Cheerleading Club? http://managethosethings.com/wp-content/uploads/2018/06/Manage-Those-Things-2-300x100.png 0 0 Manage http://managethosethings.com/wp-content/uploads/2018/06/Manage-Those-Things-2-300x100.png Manage2018-02-06 22:12:342018-06-03 14:37:43What is the Business Cheerleading Club? This is a quote from the iconic Star Wars character Yoda. He is so wise isn’t he? (I haven’t watched the newest film yet, so no spoilers please). I’ve always found Yoda to offer deep questions to those he works with. They may not always understand the question, but once they ponder it, their brain takes on the challenge, and works out a way of moving forward, or answering the question. We can all learn from this way of questioning and thinking. We all learn and process information differently. We’ve been helped over the last 18 months from the Mercury Model, to understand these differences. Some of us love new information, others of us take time to let any new piece into our head. So when a friend or colleague asks us a question about some work we’re doing, we’ll all have a different response to it. Depending how they ask the question, we may be defensive, or accepting, and then our brain will do something different with that piece of information. 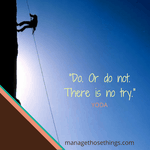 If we work with a coach, or have someone we use to bounce ideas off, they may well challenge us, just like Yoda does, and ask ‘difficult’ questions. I know I often think, “ooh, that’s a hard question to answer” when challenged in this way. But once I’ve let my brain mull the question over, and try a few different scenarios out so I can answer, I realise that it’s a question that goes to the heart of what I’m trying to do. If I can find the answer to this question, then I know I’ll have answers to more of the questions and problems I’ve been having recently. There’s LOTS of motivational quotes about taking action. And my social media feed is full of ‘take action’ blurb at the moment, (as in, it’s all very well having these amazing ideas for 2018, but you’ll only achieve if you DO something about it). It’s true! Only by doing will you achieve what you want. And Yoda is right to. What do we mean when we say, “I’ll try”. Will we try to do our best? Will we try to be the best parent ever? What does TRY mean anyway? Surely we’re going to be DOING something whilst being our best at the time? Aren’t we BEING a parent & DOING what we think is best for our family at the time? And we either pick up the phone or we don’t with that supplier we want to work with. It’s only by DOING that we’ll move things forward, or tick things off our list. If I TRY to complete everything on my list for today, I’m not focusing myself on each individual task I’ve listed. If I focus on the task and then DO that task, I’ve done my best and I’m making progress to achieve my daily tasks. There will be things that we choose not to do, as they aren’t priority. Or they’ve been on our list for ages, and we haven’t done them yet, so are they important now? By saying. “I’m not doing that”, we’re taking action on something. We haven’t failed. We’ve just prioritised what’s important to us. Life and business moves on. What felt important a month ago, may now be unnecessary, (and some may say, that’s why you didn’t do it at the time! ), so cross it off the list and move on. I’ve always found it interesting that a rugby score is called a try. If you’ve ever watched a rugby match, then you’ll know that it’s a physically demanding sport, and everyone in the team tries hard to pass the ball, tackle, with the goal of scoring a try. That’s the only place I can think of where you want to ‘try’. Every other situation we face, we want to DO and not simply TRY to do our best. Do you tell your children do “do your best”? Even if we use the word ‘try’ as from the definition in our dictionary, it says, “do one’s best”, and “make an attempt”. That’s all we ask our children to do – just their best on the day. That’s all any of us can do isn’t it? If you need help taking doing and taking action, then join our Business Cheerleading Club which will support you take action to achieve the things you want. Or, if you need more one to one support, book a coaching call with Tracey-Jane and work out what’s important on that list of yours and prioritise what’s left.